The underground geography present in London is evidently multi-layered. 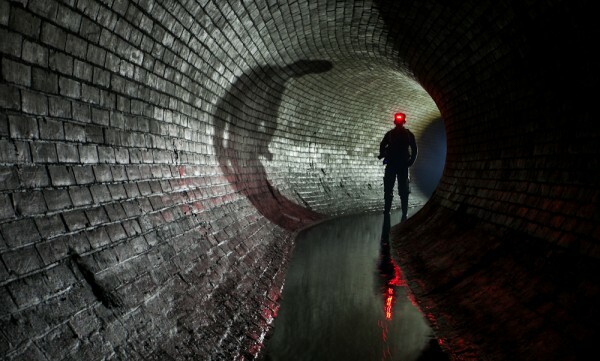 While there’s not necessarily any planned intersection between sewage, trains and other subterranean spaces, the presence of the others can be detected as you walk through. Recently, Brad pointed out to me that when we explored the Clapham Deep Level Shelter, the rumble of the trains on the adjacent Northern Line was a reminder that we weren’t alone, and that the link between the two had a relation to the wartime design of the tunnel where evacuation between the two could be facilitated. Less recently, the suspicions that the coveted 11km Mailrail network could be accessed through part of the River Fleet were eventually put to bed when we got in, and between various parties, walked the whole network. Alas, no link to the sewage pipes was found but after all the effort that went into it, it would have been a bit gutting to discover that we could have entered through on of our old friends. The bricked up sections of different tunnels suggest that once the sewage network was different, but without taking a sledgehammer to it, we’d never know. 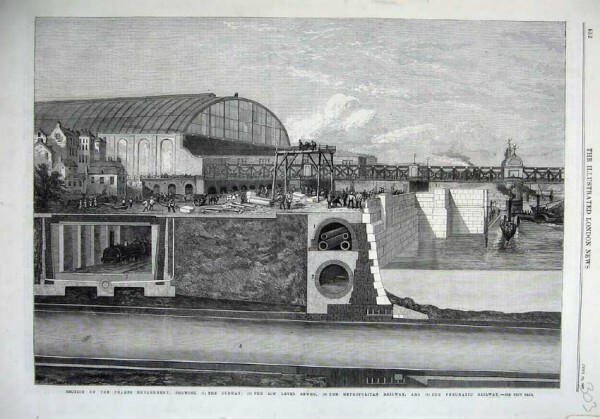 The illustration above demonstrates the simplicity of the Victoria Embankment, with the cut and cover underground tracks sat separately from the lower level sewer pipe, and the cable runs that sit above it. Despite sharing the space, these areas of underground space only ever really run parallel to each other. There are anomalies such as where the District, Circle and Hammersmith and City lines run over the River Fleet, and the flow of the River Tyburn passes over Sloane Square station in a conduit. Paris is altogether different. You can run from power tunnels to water supply tunnels to drains, and then back again into the famous Catacombs. Minneapolis St Paul and Stockholm have similar networks, and it makes me wonder why London’s is so different – maybe it’s just the sheer age of it? The sewage and drain pipes themselves are a network in a way that the entire underground utility services in London are not. 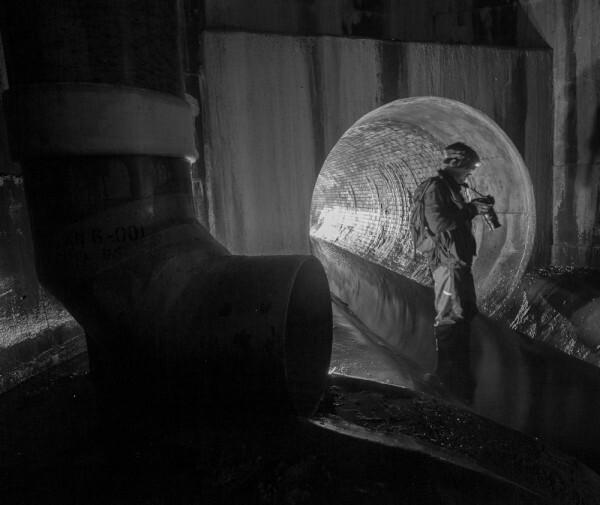 The waste and storm system interlink, and waste follows a journey from a toilet, through a local sewage pipe, before feeding one of the more familiar ‘explorable’ tunnels. 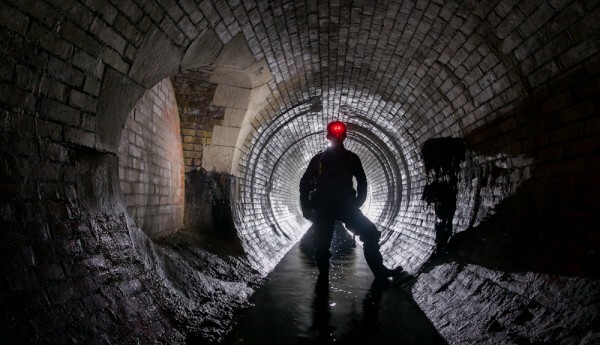 Eventually it is intercepted into one of the main sewers out to either Crossness or Abbey Mills pumping facilities, where the waste is taken away from the city. 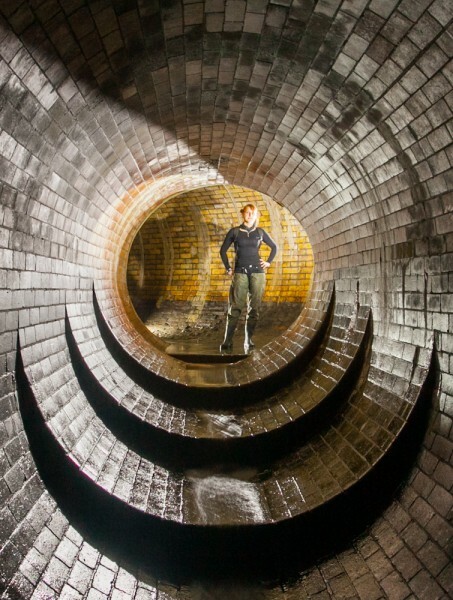 When it rains, the main drains can either overflow firstly into one of the storm storage tunnels, and if it’s really bad, into the Thames itself. The network was built to serve Victorian London when ‘The Big Stink’ became too great, and additions in the 1920s and 30s added to this, before more recent concrete pipes. It’s never going to be enough in this growing, thriving city, and the prospect of a London ‘supersewer’ to resolve these issues brings both intrigue from those interested in these systems, to anger for those who will be affected by the works. 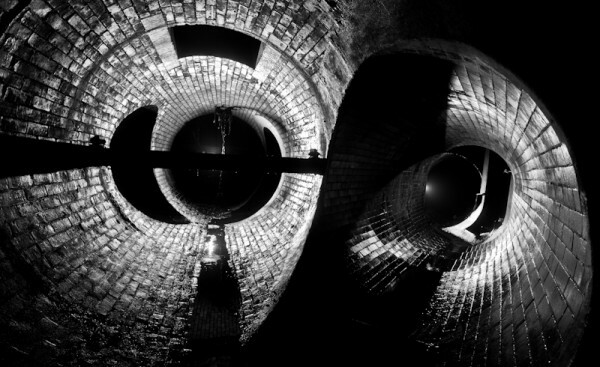 The underground systems of a periodically evolved city are never really planned. The commercial ventures of the subterranean rail lines and power supply tunnels have to share space with the municipal services like waste. Without the governance of city officials dictating what goes where and how it works, the organic system that London has borne will continue to evolve into a subterranean spiders web of services with the various nuances that make it unique and fascinating.